Tunisia's Youssef Chahed has rebuffed any responsibility for the events that led to a Tunisian national perpetrating the Berlin Christmas attack. Chahed is to meet with German Chancellor Angela Merkel in Berlin. Tunisian protestors hold a banner reading: "Angela Merkel, Tunisia is not Germany's waste disposal." Ahead of Tuesday's state visit to Berlin, Tunisia's Prime Minister Youssef Chahed rebuffed any responsibility for the events leading up to December's terror attack in Berlin, in which a Tunisian national due to be deported killed 12 people and injured more than 50 others. Ahead of talks with Chancellor Angela Merkel, Chahed told Tuesday's edition of the German "Bild" newspaper: "Let me make one thing perfectly clear - the Tunisian authorities did not commit a single error." German authorities had been monitoring the assailant, Anis Amri, for over a year before the Berlin attack and had rejected his asylum request last June. However, German immigration authorities had failed to deport him after Tunisia had not issued a replacement passport that would have allowed him to return. At the time, Tunisian authorities reportedly maintained that Amri was not a Tunisian national. The country further stated that German authorities had provided them with the wrong name. "Amri was not a terrorist when he left Tunisia in 2011, nor did he show any signs of radicalization," Chahed said. Amri is believed to have first become radicalized while he was detained in an Italian prison. He was shot and killed by Italian police in Milan four days after the attack in Berlin. The Tunisian Prime Minister is expected to visit the scene of the attack on Berlin's Breitscheidplatz. "We deeply regret what happened in Berlin," Chahed said. "It's something that deeply concerns all Tunisians, as we ourselves suffered three separate terrorist attacks in 2015." Merkel pledged last week to raise the issue of speeding up the return of rejected Tunisian refugees. The chancellor said she would discuss the issue with Chahed: "we will make sure how we can work closer together, particularly when it comes to reducing the terror threat." Chahed praised the current cooperation between the two countries in his interview with "Bild" but also called on the German authorities to prove that anyone scheduled to be deported back to Tunisia was a genuine national. "Illegal migrants, who often used forged papers, often complicate and delay the process," he said. Merkel's hardline stance on deportation has prompted criticism among senior figures in the Green and Left parties. Green party leader Katrin Göring-Eckardt told local media that Merkel risked committing the same mistake as she did in forging a migrant deal with Turkey. "Last year's migrant deal with the EU "shields (Turkey) from western denunciation," she said. Left party chief Katja Kipping warned that Merkel should distance herself from any plans to set up refugee camps in Tunisia and "instead push Tunisia's Prime Minister to respect human rights rather than enforce an escalated refugee repatriation policy. Their concerns come after rights group Amnesty International reported 23 instances of "brutal" torture committed by Tunisian security officials and called into question claims by the government that Tunisia was a "safe country of origin." With the EU looking to stem the flow of asylum seekers crossing the Sea, Chahed rejected the idea of similar proposals to those adopted by Libya two weeks ago at the EU Malta Summit. While Libya has agreed to set up "safe" refugee camps for Europe-bound migrants, Chahed said he saw no option for such an agreement between Europe and Tunisia. 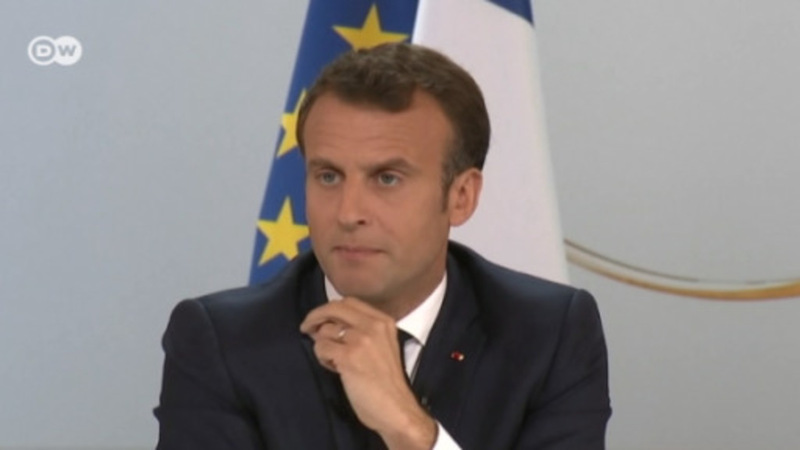 "Tunisia is a very young democracy and I don't think that it will work, or that we have the capacity for refugee camps here," he said, adding that any prospective solution must be made in conjunction with Libya. More and more rejected asylum-seekers are being sent back to Tunisia, Morocco and Algeria, according to a new report. The German government wants to designate the countries as "safe" in order to accelerate the process. The German chancellor says that her country continues to seek an "orderly" Brexit, but is preparing for harsher eventualities. The topic dominated Merkel's second-ever parliamentary Q&A session.